It's sort of surreal to look back and think about how much my life has changed in the past 12 months. I've spent the last year in full mommy mode: first, in my very first pregnancy and for the last few months, as a new mommy to baby Hannah. And being both pregnant and a mom for the first time, I've basically become a sponge soaking up all of the knowledge and tips from the more experienced moms around me. Among all of those tips, a few have proven to be most valuable: Use high quality diapers-- because blow outs and leaks are pretty much the worst things ever-- and get a Costco membership-- because babies are expensive. Hannah's first Costco trip! And for the first time, we visited the diaper section and it was all about her. I joined Costco when I was pregnant so we could have the house stocked with food, toiletries, and household items for when baby arrived and now I can now officially declare myself a convert. As any infant mommy knows we go through a LOT of diapers and thankfully, Costco (and only Costco!) carries Huggies Little Snugglers Plus diapers. That means I can stock up on quality diapers at a great price. 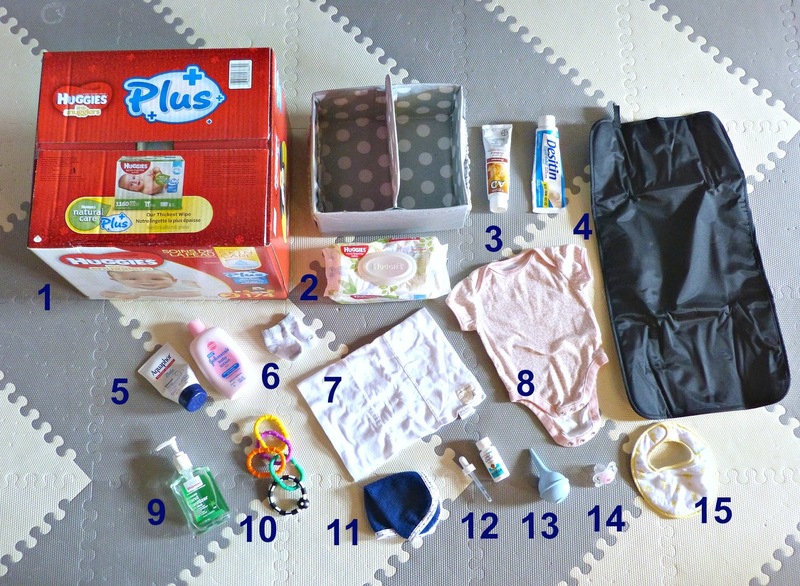 And diapers with 12 hours of Leak Lock® protection, that are super absorbent, keep my baby's skin clean and dry, and that include a wetness indicator (my husband's diaper changing requirement) are definitely the kind I want to have stocked in my baby's nursery! As I mentioned earlier I've been taking in all the parenting tips I can as I navigate new mommyhood. However, in my short 4 months of being a parent myself I've come up with a few of my own tips too. And one of those tips is to have a stocked diaper caddy at the ready. We have only just started using Hannah's room regularly in the past few weeks. Prior to that, she spent all of her waking and sleeping hours in our bedroom or the living room. In the interest of time and my sanity, it didn't make sense to run back and forth to her room every time she needed a diaper change, a change of clothes, or a clean pacifier-- especially in the wee hours of the morning. 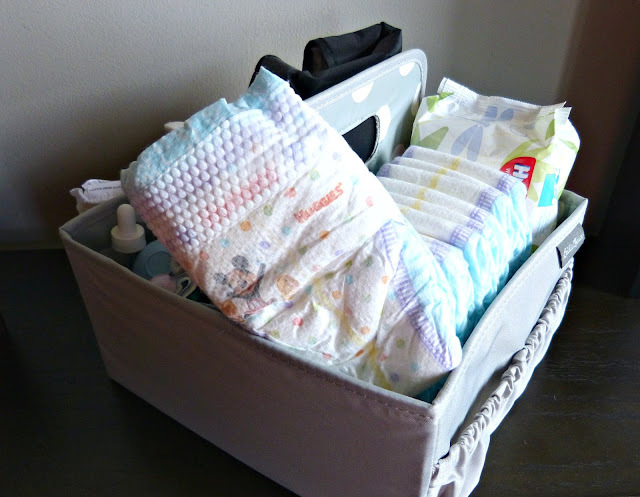 So I stocked the perfect diaper caddy that could conveniently follow us from the living room during the day to our bedroom at night with everything we needed to take care of Hannah. And it was a lifesaver! So if you're a mommy-to-be, take it from a new mom who has been there, done that and get yourself a diaper caddy and get it stocked and ready for your return home. It's a little thing that will make your life feel a whole lot easier. 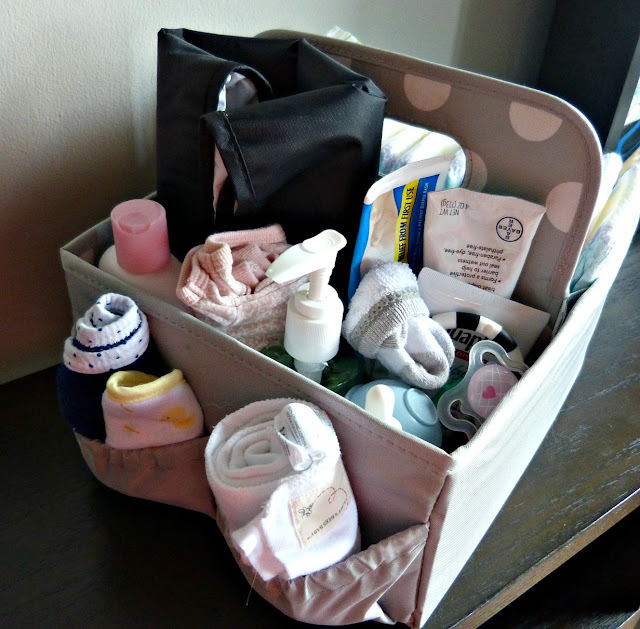 And if you're shopping for a mommy-to-be, consider gifting her a stocked diaper caddy. She'll be so thankful! 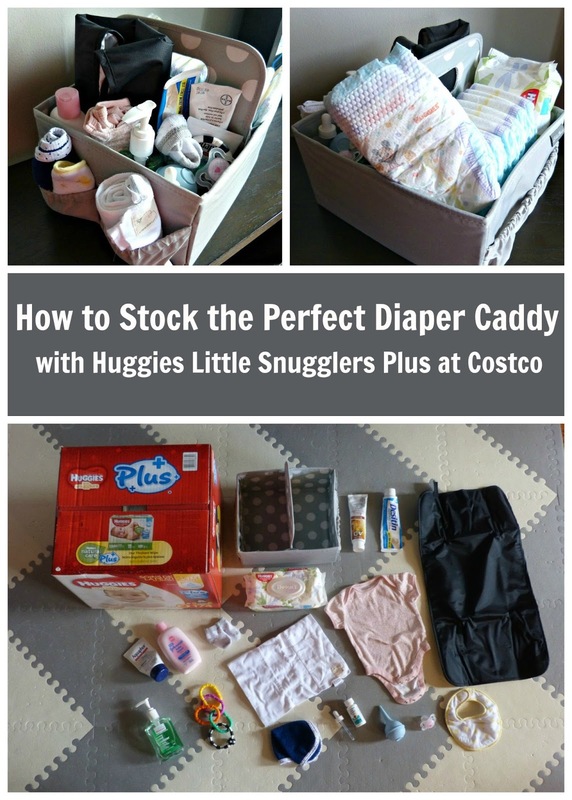 Plenty of Huggies Little Snugglers Plus Diapers - Especially with a newborn, you'll go through tons of diapers everyday, so stock half the caddy with Huggies Little Snugglers Plus diapers and you'll be in great shape for a diaper change no matter where you are. Huggies Wipes - Every good diaper change needs a good wipe! Include a package of Huggies wipes too. Diaper Cream - Another diapering essential. 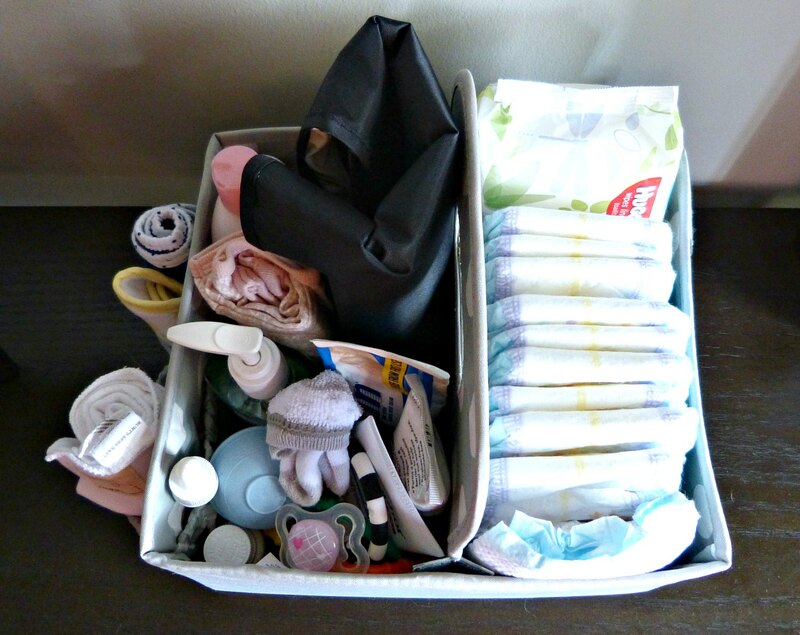 I recommend having a diaper cream and/or ointment at the ready in your caddy and another at your nursery changing table too. Changing Pad - A portable changing pad that folds or rolls up small allows you to change a diaper anywhere-- on the couch, on your bed, etc. without worrying about making a mess underneath baby. Lotion – Newborn baby skin goes through some weird stages and extreme dryness is definitely one of them. I always have baby lotion and a super moisturizing ointment at the ready so that I can moisturize Hannah’s skin. And post-diaper change while you’ve already wrestled your baby out of her pajamas is the perfect time for that. Socks – Especially when Hannah was very little, I was always concerned she was too cold. Her bare feet always seemed freezing! Have an extra pair of socks in the caddy for when things get chilly—or for when your baby inevitably kicks one or both of her socks off and you can’t locate them. Burp Cloth – You never want to find yourself with an infant that’s just eaten and no burp cloth. That is almost always when you’ll find yourself with spit up down the front (or back) of your shirt. Always be prepared with a spare burp cloth! Change of Clothes – Babies are messy and it’s not uncommon that they’ll end up needing at least one change of clothes throughout the day. Keep a spare onesie in the caddy so that you’ve got it at the ready when a mess strikes! Hand Sanitizer – Hand sanitizer is a quick and easy way to clean your hands after a diaper change or even to quickly rid your hands of germs before handling your little one. They put everything in their mouths-- including your hands—so make sure they’re clean! Small Toy – Having a small toy within arm’s reach (like this little ring of links) is a great way to keep a baby distracted while you deal with a diaper change! Washcloth – I like having a baby washcloth nearby for so many reasons. It’s a gentle way to wipe up a messy face or hands. It’s also helpful if you’re in the midst of treating cradle cap (which we are just getting over) so that you can moisten baby’s head before moisturizing and then clean her up afterward. Gas Drops – Hannah is generally a really happy baby. However, gas pain makes her absolutely miserable—and it usually strikes in the middle of the night. Gas drops are sometimes the only thing that will calm her, so we always make sure they are at the ready. Nasal Aspirator – A baby with a stuffy nose is usually an unhappy baby. They don’t love having their noses cleaned out either, but a nasal aspirator is a necessary evil—especially when you’re trying to feed or put your stuffed up baby to sleep. Pacifier – My pacifiers seem to vanish into thin air. They’re either in some pacifier blackhole somewhere or in my dog’s belly… I’m hoping for the former! So, I like to make sure there’s always one stashed in the caddy for when a cranky baby needs soothing. Bib – You may have noticed the theme here that babies are messy. At about 3-4 months (where we currently are), they begin to drool nonstop. Be prepared with a cotton bib for baby to roll around in, which will spare her outfit from getting totally soaked! One of my favorite things about summertime is the amazing seasonal produce. Living in the Midwest, our cold winters can make eating tons of fresh seasonal produce and herbs all year round a challenge so we are sure to take full advantage of what's available in the warmer months. We live a few miles away from Chicago's Green City Market, a huge twice weekly farmer's market that hosts dozens of farms, artisans, and vendors from Illinois and the neighboring states of Michigan, Indiana, and Wisconsin. Hannah is an early riser and Clery loves a long walk, so we've made a little Saturday morning tradition of heading out first thing in the morning, stopping for coffee and pastries, and then walking down to the market. It gets Hannah out and about, tires the dog, and ensures that Alex and I get a little exercise and some healthy food for the coming week. After we returned last Saturday, we were tired and decided that dinner should be something low maintenance that we could enjoy while we wound down from the day. I surveyed our kitchen and our farmer's market haul and decided we'd grill some smoked Italian sausages (from Paulina Meat Market-- the best!) along with the sweet and spicy peppers and an onion that we had picked up earlier that day. 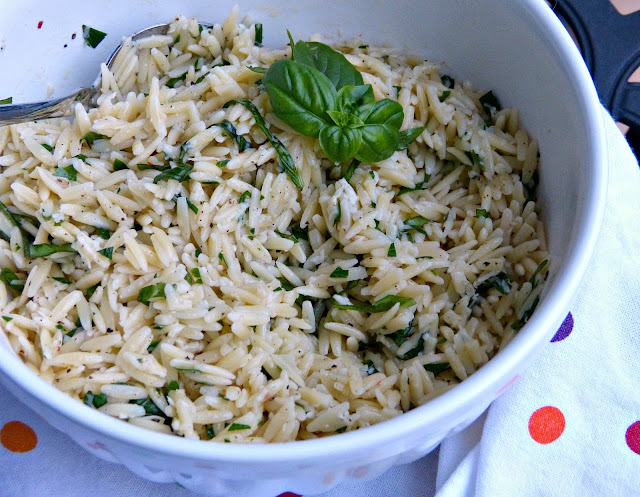 To round it out, I made a super simple orzo that's the perfect summer side dish! 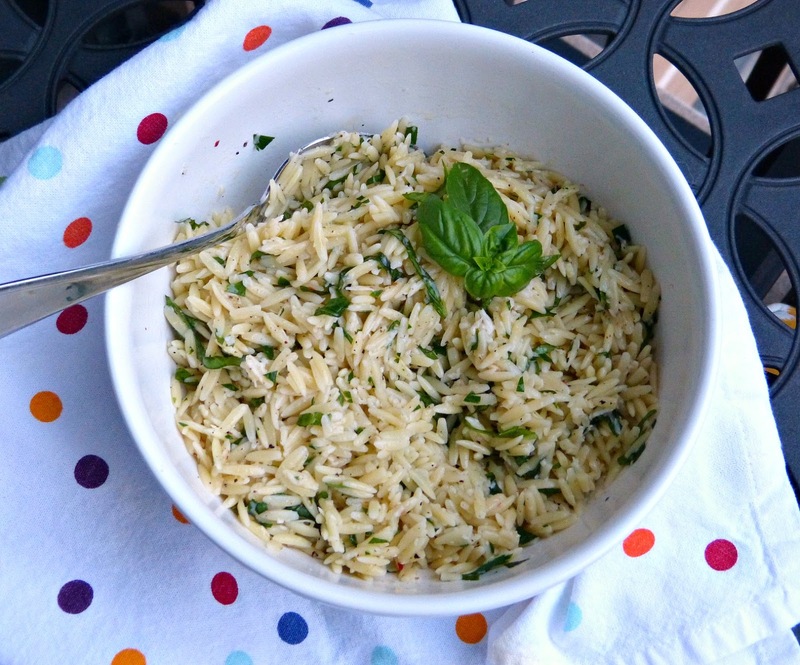 This orzo has a ton of fresh flavor from a little lemon juice and 3 different kinds of fresh herbs: basil, oregano, and parsley. The flavors complimented the Italian sausage nicely, but could also work really nicely with a grilled chicken breast, shrimp, or even a steak. A little fresh Parmesan finishes it off and that's it! It's so easy to make, is a great way to use up the herbs from your garden (or from the farmer's market! ), and is delicious served cold, warm, or at room temperature. In a medium bowl, combine orzo and next 7 ingredients through red pepper flakes. Fold in the grated Parmesan. Season with additional salt and pepper to taste. Newsflash: Being a mom is hard. Being a working mom is really hard. The transition from spending 24 hours a day with Hannah to only getting a few precious hours of awake time with her every day has been a big adjustment, to say the least. I'm thankful that we are over the witching hour hump and that when Alex and I come home in the evenings she's in a good mood and full of gummy smiles and giggles for us. The hard part is that she's usually ready for bed by 7:30 which doesn't give us a ton of time to spend with her before it's time for her to go to sleep. So I've been trying to find a balance between making sure that Alex and I have a healthy homemade dinner most nights and that we're also able to spend those precious post-work hours playing with Hannah instead of cooking in the kitchen. With that in mind, I've made a conscious effort in our weekly meal planning to incorporate as many shortcut, slow cooker, make ahead, and freezer-friendly meals as possible. And it has brought a little bit of peace and sanity back to my weeknights. Sunday food prep has become a big part of this strategy and I try to spend a little time after our weekly grocery store trip getting things in place for the week to come: making a big salad that I pack for lunch all week, prepping the slow cooker for Monday night dinner, or making a double batch of anything (one for this week and another for the freezer) like these meatballs, for instance. 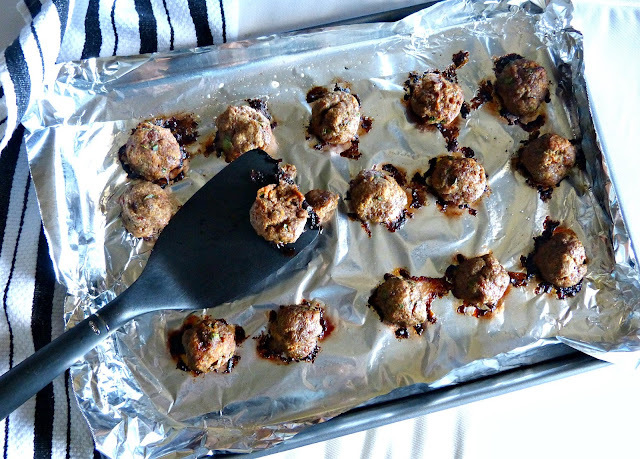 This meatball recipe is super simple and really easy to double or even triple if you're feeding a crowd or looking to stock your freezer. The seasoning is pretty basic, so you're not tied to serving them alongside a pile of spaghetti-- although they taste amazing after being simmered in marinara sauce for a while! Most of the additional ingredients are staples you likely have in your fridge and pantry already, so just add some good ground beef-- I like to use an all natural 85% lean ground beef. 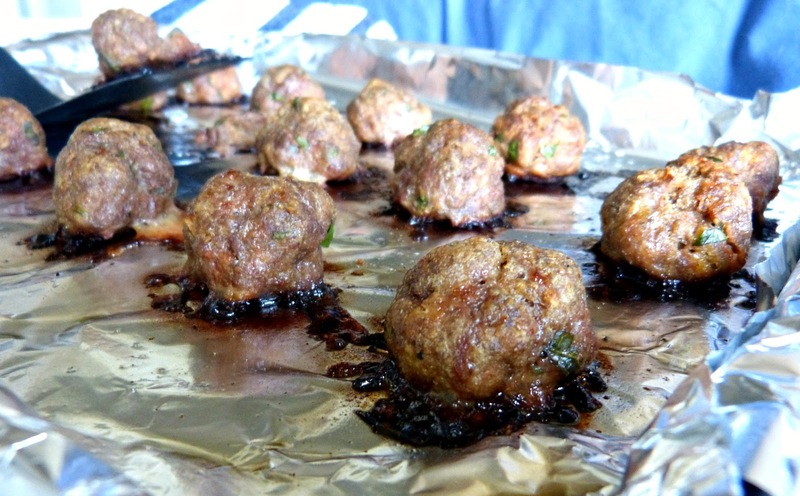 I prefer the flavor and that fat content keeps the meatballs nice and moist, but if you like them on the leaner side that works too. They are simply seasoned with garlic powder, onion powder, and fresh parsley which is a versatile flavor combination. If you have a more definite flavor profile in mind, adding basil, oregano, or rosemary would be delicious too. 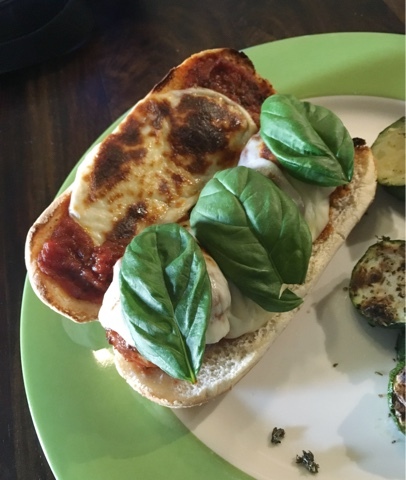 Looking for some alternatives to pasta dinners, I served these in hoagie rolls with marinara sauce, basil leaves, and melted provolone. 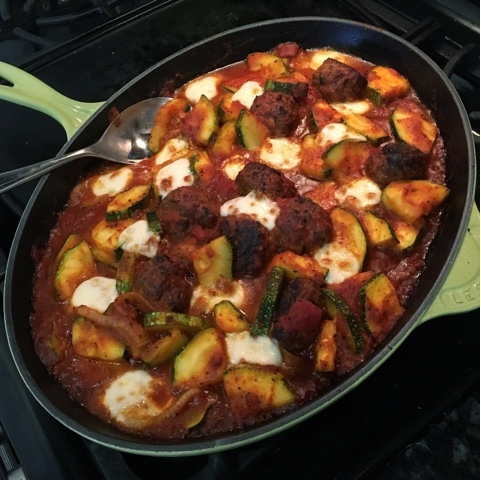 Another night, I sautéed sliced zucchini and then added the meatballs and some marinara sauce, simmered for a few minutes, topped with diced mozzarella and broiled until the cheese was brown and bubbly. Both dinners are delicious and simple-- and made even easier using these precooked meatballs! Preheat oven to 375 degrees. Line a large rimmed baking sheet with aluminum foil. Spray lightly with cooking or olive oil spray. Using your hands, mix all ingredients in a large mixing bowl until just combined. Roll mixture into golf ball-sized balls. Place on prepared baking sheet, evenly spaced out. Serve in desired recipe or cool and then freeze in airtight container. Although I love going out to some of our favorite restaurants or trying new ones, I have always had a special place in my heart for a date night at home. There's nothing better on a Friday night after a long week of work than coming home, putting on sweats, ordering in, and enjoying a glass of wine and a movie with Alex. And now that we are new parents and even while I was pregnant and exhausted, this has definitely become more the norm for us-- sans wine during pregnancy, of course. Living in Chicago, we have hundreds of different choices for takeout dinners-- cuisines and delivery/order methods. Even with all of those options, Alex and I almost always come back to pizza. And we're lucky to have some great options right in our neighborhood! Frasca is, of course, always one of our go to's for pizza, pasta, and salads. Today I'm also sharing three more of my favorite Lakeview spots for enjoying a pizza to go! Blaze Pizza is definitely one of the more unique options for pizza in the neighborhood. It's part of a national chain, so if you're not in Chicago it's possible you've already been to a Blaze elsewhere. In fact, the first time I dined at Blaze was on a quick business trip to Indianapolis. 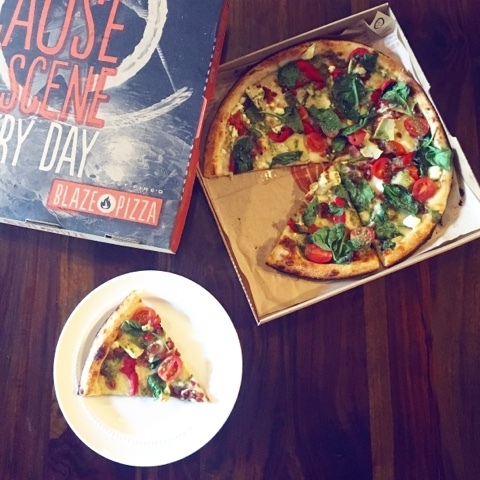 Blaze is a fast casual spot where you can create your own pizza on demand with a variety of toppings (a la Chipotle). Blaze offers a great menu of signature pizzas, but the build-your-own option is really where it's at. Once you get in line and select your original or gluten-free crust, an array of dozes of toppings are available for you to top your pizza with: sauces, proteins, cheeses, and tons of vegetables. I love that I can order something new every time and never get bored! A few of my favorite toppings include Blaze's pesto sauce, mozzarella ovalini, goat cheese, roasted garlic, and banana peppers. And once you've built your pizza, it goes into the oven for 180 seconds and then you've got a freshly baked made to order pizza that's all your own! Blaze is one of our favorite options for lunch when we are out and about in the neighborhood. Our nearest location is also conveniently located next to the Belmont "L" stop, so it's also a nice option for picking up an easy, tasty, and cost effective dinner on the way home from work. Not interested in venturing out? 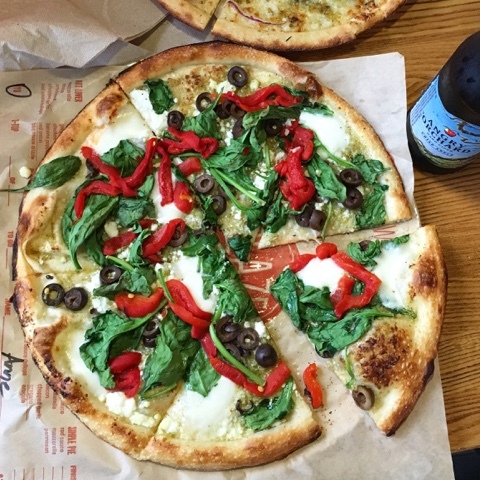 You can also order and customize your Blaze pizza and have it delivered to your door via Postmates! Use code FSVD and get $10 off your first Blaze Pizza delivery via Postmates! Pizzeria Serio is most definitely a West Lakeview/Roscoe Village neighborhood gem. It's located on a quiet block of West Belmont and the restaurant itself is pretty unassuming. It's a casual family-friendly spot with a small bar in the front and a big brick pizza oven in the back. We have only eaten in the restaurant twice, but have picked up a pizza to go more times than I care to mention. And let me tell you, this is not your standard greasy takeout pizza. "Serio" translates to "serious" in Italian and that's exactly what this pizza is-- it starts with a hand tossed crust that's just thin enough (not cracker-thin) that bakes up perfectly chewy and charred in their pizza oven. And each pie is topped with high quality ingredients. I always go back to their Margherita pizza with fresh mozzarella and basil. Alex loves their Diavolo pizza, topped with a combination of spicy peppers, onions, and hot sopressata. Our typical order is a pizza for each of us (which is enough for dinner plus a few extra meals) and a Caesar salad to share, but lately I've been trying some of their other menu items too. The build-your-own calzone is great option and since it's made with their signature pizza dough it's really delicious. I'd also mention that the pesto flatbread, meatballs, and garlic sticks are all solid options if you're not in the mood for pizza too. When we moved to this neighborhood we had never heard of Art of Pizza but as soon as our Chicago friends found out where we were moving to, this pizza place's name came up over and over again as a deep dish 'must try.' In fact, the Chicago Tribune once named it the best deep dish pizza in the city. So on one very snowy Friday night we took everyone's suggestion and placed our very first Art of Pizza order. Spoiler alert: We haven't tried their deep dish stuffed pizza yet. I often feel like I'm in need of a triple bypass surgery after eating a slice or two of stuffed pizza, so instead we ordered from their pan pizza menu. Art of Pizza offers decadent stuffed pizza, crispy thin crust, and the pan pizza, which is somewhere in between. It has a great thick and slightly crunchy crust, a slightly sweet and nicely spiced sauce, and a healthy amount of stringy melted cheese... it doesn't really get better than that! Even though it wasn't their stuffed pizzas, these were still rich and filling so one pie can definitely stretch for a few days. I'm told that the also sell deep dish by the slice in the restaurant, which is unheard of and also genius-- for those times you just want to enjoy one piece of deep dish and don't want to wait 90 minutes for it or to be eating it for days afterward. That's next on the To Eat List!